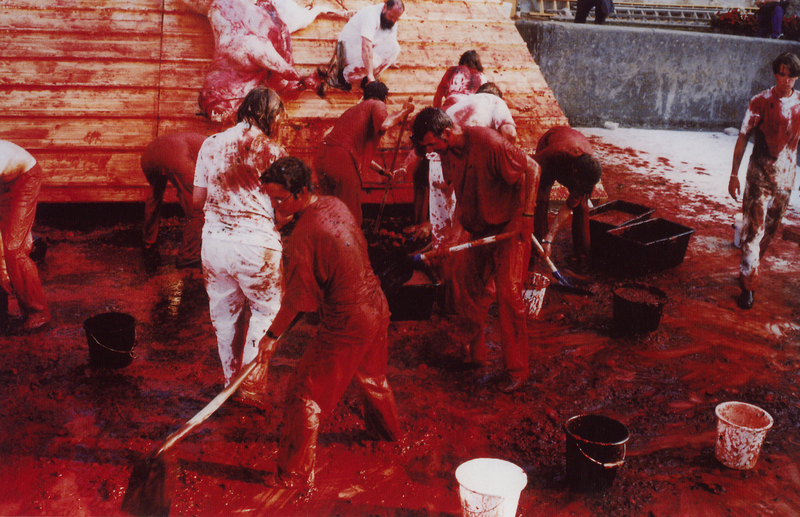 The dual exhibitions of Hermann Nitsch’s work at the Hudson Valley Center for Contemporary Art (HVCCA) and New York’s Marc Straus Gallery both feature vestments and splatter-painted canvases — essentially objects from Nitsch’s Prinzendorf Orgien Mysterien Theater, six-day mystery performance rituals he has staged continuously since 1961. These objects, with their inherent animism, allow us to experience a microcosm of Nitsch’s large actions, and function as religious relics. Nitsch has been producing splatter paintings that serve as backdrops for his events for decades; the earliest were made with blood, though now acrylic and oil paint are sometimes substituted. Both exhibitions feature similar large-scale splatter canvases and vestments, with several additions. At Mark Straus, the stunning eighteen-foot-high, “Schuttbild” (2011), with a cruciform sculpture containing vestments mounted on the painting’s front, converts a tall gallery wall into an apse with two large splatter paintings on each side forming a nave. On display at HVCCA is “Leviticus,” (2010), a painted book with canvas pages produced in Israel, that acts as a leitmotif for the exhibition. 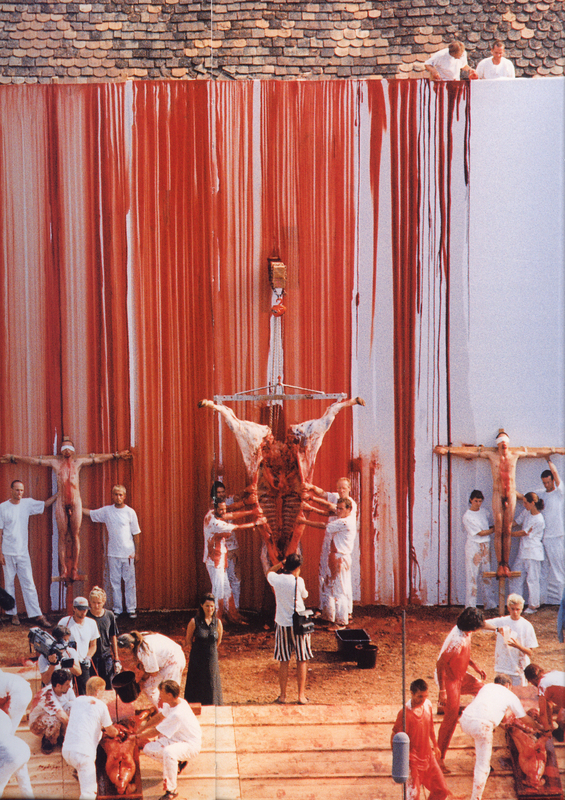 In addition, three large splatter paintings Nitsch called “Stations of the Cross” (2010), paired with the racks of Catholic vestments and a chalice, create a chapel for “Leviticus,” whose pedestal functions like a main altar, amplifying the spiritual dimension of Nitch’s practice with the addition of this sacred text. Orgien Mysterien Theater rituals use purification (catharsis), drinking (communion), bathing with animal blood, totem meals, and sacrifice (mock crucifixion). The ritual’s participant (mystai) undergoes a symbolic death and rebirth; this is a powerful initium, as we have few rituals that attempt to do this in modern life, or in today’s art world. Nitsch’s reading of Jung’s alchemical volume The Mysterium Coniunctonis and his essay “Transformation Symbolism in the Mass” from Psychology and Religion: West and East, fueled his work — like Jung, Nitsch reminds us that it is what is left untransformed below the threshold of consciousness that determines our experience, not our rational will. Nitsch also engages us in a serious dialogue about the importance of transformative religious rituals and their role in human development. If there was ever a time when, as the ancient Greeks said, we need to “fill our spirit with flesh and flesh with spirit,” it is now. Nitsch begins with splayed carcasses representing Dionysus in his bull form and combines pagan ritual with rites of the Catholic mass, in order to bring the numinous into modern life. Mysterien is the key word in Orgien Mysterien Theater. The Eleusinian mysteries — secret rites dedicated to Demeter and her daughter practiced by the Ancient Greeks for 2,000 years — linked agricultural renewal in the underworld with transformation below the threshold of consciousness. Nitsch’s now 138th ritual summons us to heal a split in the basement of our psyche. Christ and Dionysus are both chthonian and resurrected, “gods of the vine” — connected but warring opposites. In our age of possible nuclear warfare, carnage, and gun violence, not honoring Dionysus has unleashed an “epidemic” of madness — Euripides tackles this problem in The Bacchae. We see ourselves in the warmongering ancient Macedonians, with our era of endless conflict. Nitsch also reconnects us to fertility and to the origins of a Greek theater founded on Dionysian ritual, with its cult of salvation and sacrifice. Dionysus in his positive form was the god of vegetation, the fecund forces of nature. In our one-sided, materialistic society void of transformational rituals, we need these mysteries of rebirth and agricultural renewal. Nitsch’s “Aktionismus” also represent a path not taken by Christians, even though one of the religion’s founding fathers, Clement of Alexandria, had been initiated into the Phrygian mysteries. Vatican City rests on the site of an ancient taurobolium, where Attis priests of Cybele stood beneath grates to receive consecrandus, a drenching in slaughtered bulls blood. The blood was thought to affect man’s life force; a Roman altar from 376 BCE bears the words “reborn for eternity” — blood represents new life. For Nitsch, blood contains neuma (spirit), and also purifies. “Aktionismus” members both bathe in and drink animal blood, causing them to experience an updated version of both transubstantiation and incarnation. 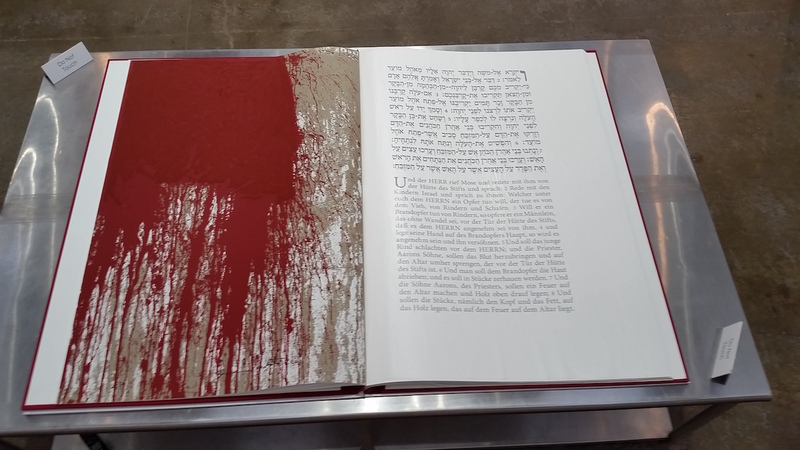 The book of Leviticus at HVCCA is an important addition to this blood dialogue. The left-hand pages are painted by Nitsch (and resemble the canvases on the walls), and Biblical text in Hebrew and German is printed on the right side. The book is open to Leviticus 16: 1–34, where God instructs the High Priest in the Temple on the High Holy Days. During that holiday, Moses performs a purification ritual in which the blood of the sacrificed animals bathes and purifies the priests so that they can represent the people and pray for the atonement of their sins. The catalog essay for the Jerusalem Leviticus exhibition (2010) by Ory Dessau stands out as one of the better pieces of writing on Nitsch, amplifying the Old Testament and Christian roots of his work. The vestments on view (traditionally worn by priests celebrating Holy Eucharist), along with a chalice, link the Catholic Holy Communion to Nitsch’s “Aktionismus,” enlarging the archetypal container of the rite. In Nitsch’s work, the Christian Eucharist is also aligned with the alchemical Red Mass. Jung compares the Eucharist to the Visions of Zosimos, the 3rd century BCE alchemist. Zosimos is also an underworld barber who scalps and sacrifices himself. The surgical tools Nitsch places on his altars, along with the shirts worn by ritual participants, are references to Zosimos and the idea of a self-sacrificing god. Like the priest who sacrifices himself in Jung’s Transformation Symbolism in the Mass, the “Aktionismus” participant becomes his own sacrificial priest and creates his own bloody vestments. Political movements alone will not transform society. Nitsch reminds us that rituals of transformation, sacrifice, and regeneration take us back to our origins. Such rituals have shaped civilization for centuries, and we currently have none. Nitsch’s art addresses the ancient roots of our contemporary crisis, where the Dionysian in its destructive form is now being witnessed in beheadings, bombings, and global destruction. Any solution to our destructive primitivism must begin in the psyche of the individual, and Nitsh’s transformation rituals work both individually and collectively. In our age of superficiality, this old Austrian artist/hierophant and showman still has a lot to teach our increasingly sterile academies and mercantile art world. These dual exhibitions are a welcome addition to a time in which matters of spirit are often sidelined. 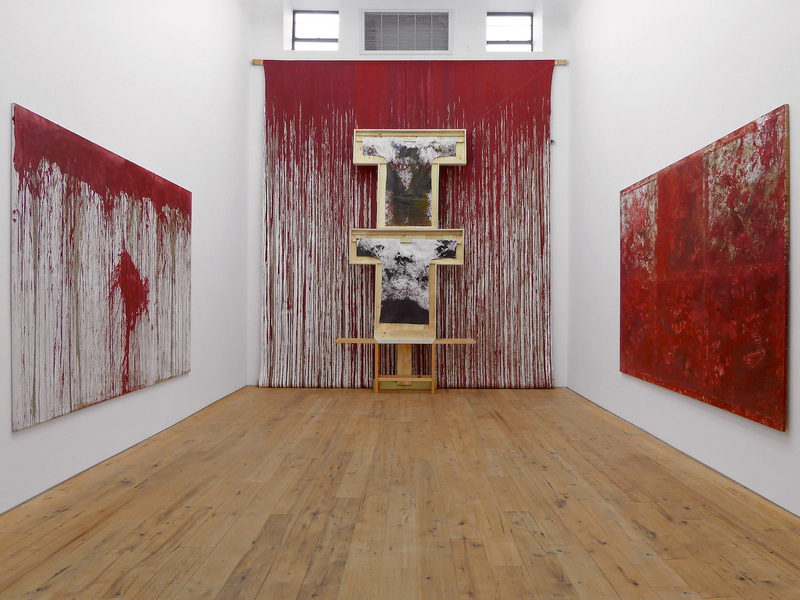 Hermann Nitsch continues at Marc Straus Gallery (299 Grand St, New York) through October 18. 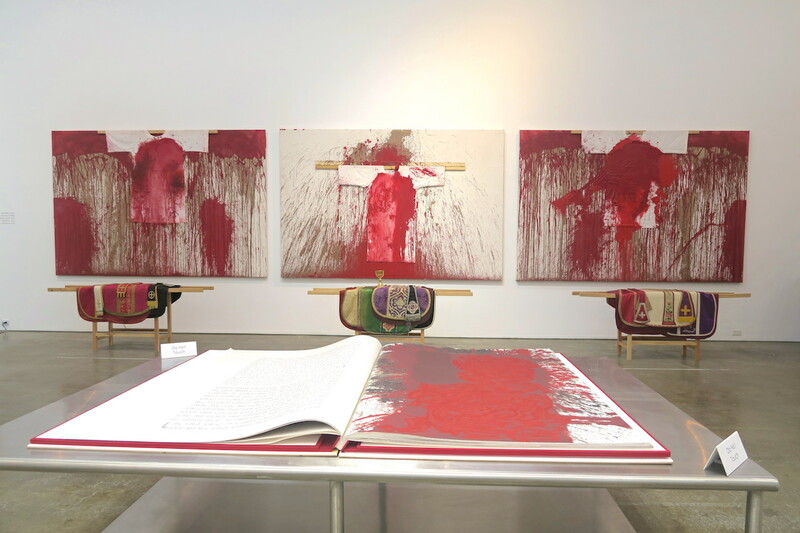 Hermann Nitsch: Leviticus continues at Hudson Valley Center for Contemporary Art (1701 Main St, Peekskill, NY) through December 6.